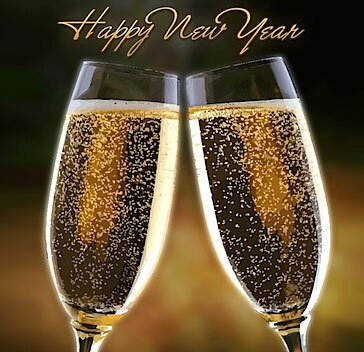 As 2010 draws to a close it's a time to reflect. I'm glad to say that I've had a great year with amazing reads along the way. 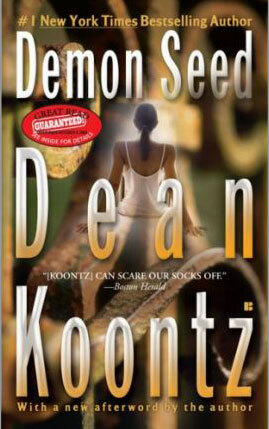 I just finished reading the last book of the year and with that the total number of books I read in 2010 comes to 112! Not to shabby since there were times I wasn't sure I could make it to my goal of 100. I'm already well into my next challenge. In case you missed it, my goal for 2011 is going to be to read 50,000 pages before 22 December (I couldn't wait for 2010 to officially end so I started a wee bit early). At the moment I'm 3.65% done with 1862 pages already in the bag. This year I managed to read over 100 books (108 and still going) for the 100 books in 2010 challenge. Since completing a book now lacks that sense of achievement I've decided it's time to start on a new challenge. This time around I'm going to focus on reading 50,000 pages within a year. Since page sizes tend to vary from book to book this won't be an exact science, but where possible I'll be reading paperbacks and using the total pages from each paperback. If I read an eBook I'll be using the stated page numbers for the paperback edition of the same book. I'm so keen to get going so I've already started the challenge today, so for me it will be running from the 21/12/2010 till 21/12/2011. In all likelihood I'll be referring to it as my 2011 reading challenge even though it started 10 days early. Wish me luck! I’ve had this book in my collection for ages and I just never got round to reading it. While taking a break from reading lengthy sci-fi I finally picked it up. I was very pleasantly surprised since this is the first real horror sci-fi I’ve read by Koontz and he does an admirable job. The story is told from the viewpoint of Proteus and touches on quite a few problems/desires a sentient AI might have to cope with. Even though he appears somewhat childlike in some aspects he makes HAL from 2001 look reasonably tame (and sane!) at times. Since the original story was written in 1973 and later revised in 1997 it’s a story that really was quite a bit ahead of its time. Even the author doesn't think the 1973 edition was up to scratch, so make sure that you get the revised edition. The books that arrived this time is a simply gorgeous hardcover copy of "The Evolutionary Void" by Peter F. Hamilton from my all-time favourite online booksellers - The Book Depository! I picked this beauty up for less than half the price it sells for locally. 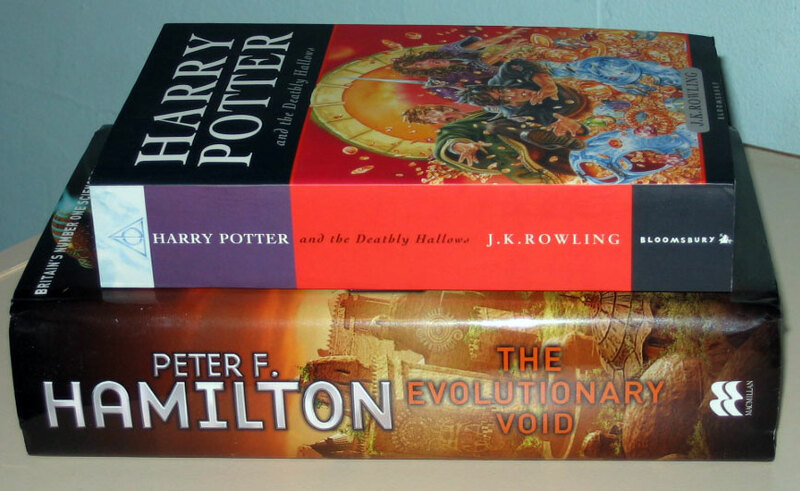 The other book is "Harry Potter and the Deathly Hallows" by JK Rowling. Not my usual fare, but it was on an incredible sale during the Exclusive Books Flasmob Fire Sale. Since my reading group are holding a Harry Potter challenge (any Harry Potter book read counts 20 points!) I just couldn't resist. 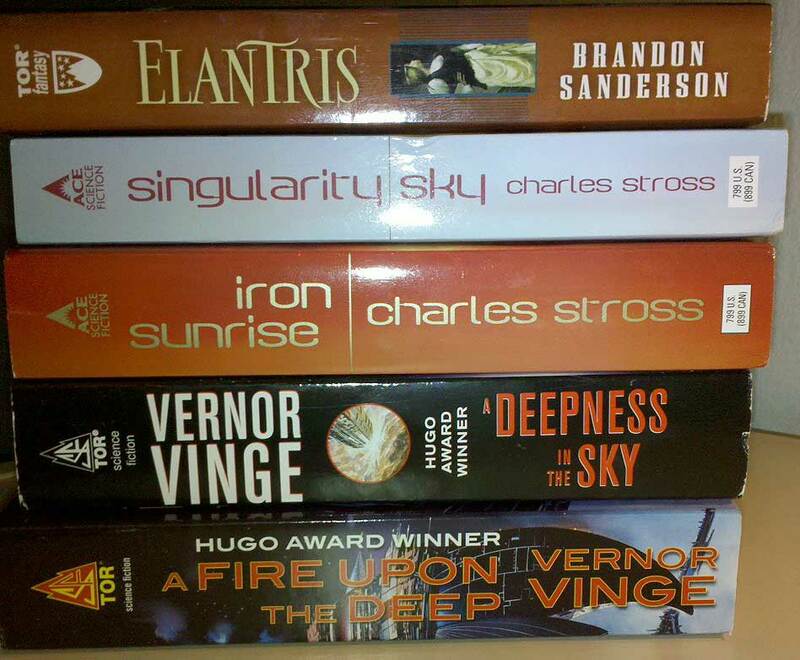 My first package of books ordered from the Exclusive Books Flash Mob Fire Sale. I'm still waiting for my previous order to arrive but Exclusive Books are apparently working on it. It seems I'm not the only one experiencing some problems. Exclusive Books have underestimated the popularity of their sales and have have put future Fire Sales on hold indefinitely. Hopefully they will be able to sort things out quickly since the Fire Sales were an EXCELLENT idea and I'm sure they gained lots of customers due to the sale. It would be really be terrible if they don't revive the sale in the future. 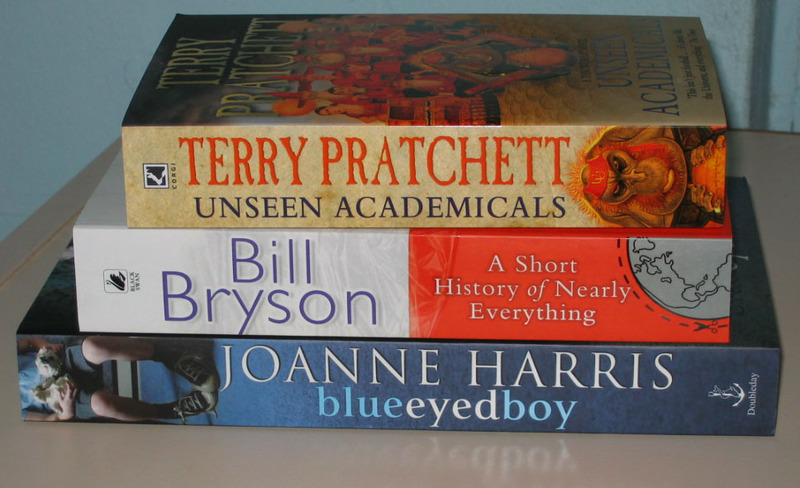 All those for the price of what a normal paperback normally goes for! 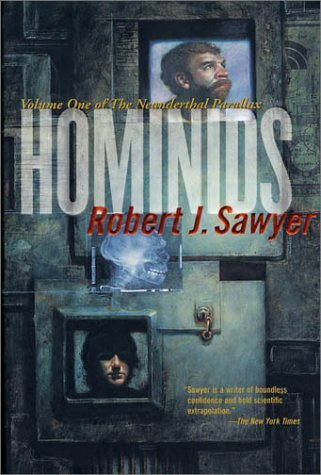 I’ve had Hominids by Robert J. Sawyer on my bookshelf for about a year now and I just never got round to reading it until now. 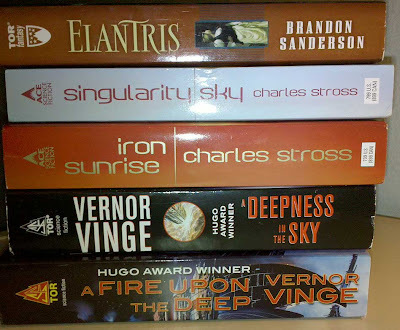 The Sci-Fi reading challenge I’m participating in provided the ideal opportunity to dig into this ‘alternate history’ tale where two parallel Universes meet. During a quantum-computing experiment Ponter Bonditt, a Neanderthal physicist, gets transported from a universe where Neanderthals instead of Homo Sapiens become the dominant species. The story focuses largely on exploring and contrasting modern Neanderthal life with that of humanity. The lifestyle Sawyer envisages for the Neanderthals is interesting and unique. In most cases it seems to be a quite plausible imagining of what could have been. In others instances it pushes your suspension of disbelief to the limits. 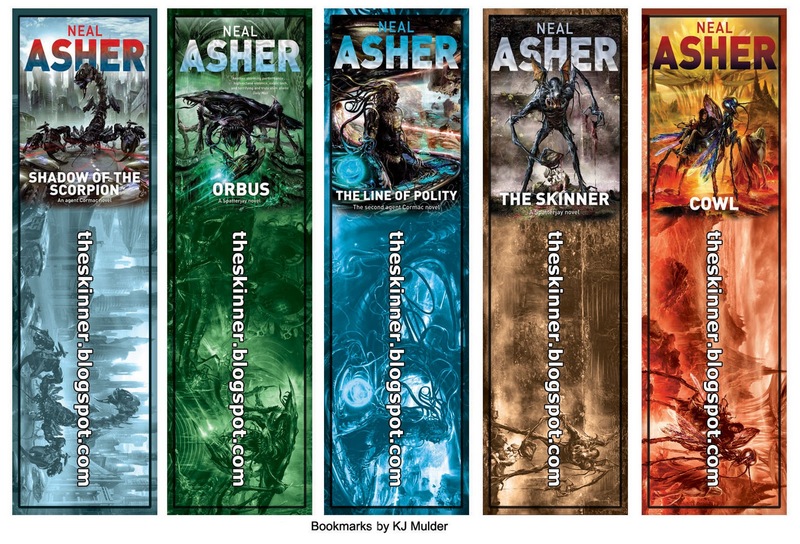 This is the first novel in the Neaderthal Parallax, but can be quite easily read as a standalone novel since it’s written in such a way that it contains a complete story in itself and is not just used for setting the stage for the rest of the trilogy. I quite enjoyed the novel. It brings interesting concepts to the table which will provide some food for thought to the average reader. For those involved in the disciplines discussed in the novel the science and conclusions drawn might show some flaws, but personally I didn’t find it much of a problem. I’ll definitely be keeping my eye out for the rest of the novels in the trilogy. 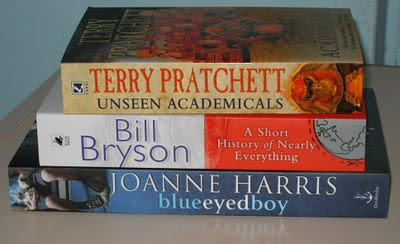 After my last book purchase I resolved to stop buying books for the rest of the year. I'm sad to say that I completely caved into my addiction due to some very tempting pre-Christmas sales and discounts on offer. The Book Depository is the main culprit. I've placed not one, but two orders with them after their 10% "Spread the Love" campaign. The lovely collection of books you see in the pic is the first order which arrived today. There's nothing quite like getting some new books through the post, carefully unpacking them and enjoying that distinctive "new book" smell. The downside of course is that I'm now well on my way to having to revert back to horizontal stacking on my bookshelves. Not to mention that my to-read list keeps piling up! 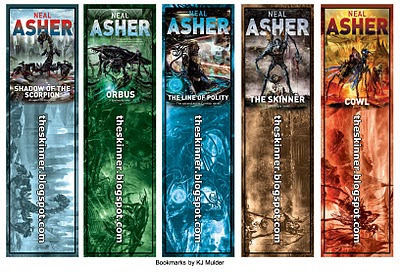 Science fiction author Neal Asher asked fans to try their hand at designing some bookmarks using the new cover designs of his novels. Having some idle time I decided to give it a go. I'm not a graphic artist, but I think they turned out pretty well.